"Exploitable" and "Economic exploitation" redirect here. For other uses, see Exploitation (disambiguation). 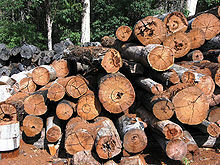 The exploitation of natural resources is the use of natural resources for economic growth, sometimes with a negative connotation of accompanying environmental degradation. It started to emerge on an industrial scale in the 19th century as the extraction and processing of raw materials (such as in mining, steam power, and machinery) developed much further than it had in preindustrial areas. During the 20th century, energy consumption rapidly increased. Today, about 80% of the world’s energy consumption is sustained by the extraction of fossil fuels, which consists of oil, coal and gas. Another non-renewable resource that is exploited by humans is subsoil minerals such as precious metals that are mainly used in the production of industrial commodities. Intensive agriculture is an example of a mode of production that hinders many aspects of the natural environment, for example the degradation of forests in a terrestrial ecosystem and water pollution in an aquatic ecosystem. As the world population rises and economic growth occurs, the depletion of natural resources influenced by the unsustainable extraction of raw materials becomes an increasing concern. The number of humans is increasing. According to the UN, there were 7.6 billion of us in 2017. This number is expected to rise to about 10 billion in 2050 and about 11 billion in 2100. Cultures of consumerism. Materialistic views lead to the mining of gold and diamonds to produce jewelry, unnecessary commodities for human life or advancement. Consumerism also leads to extraction of resources for the production of commodities necessary for human life but in amounts excessive of what is needed, because people consume more than is necessary or waste what they have. Excessive demand often leads to conflicts due to intense competition. Organizations such as Global Witness and the United Nations have documented the connection. When a mining company enters a developing country in the global south to extract raw materials, advocating the advantages of the industry’s presence and minimizing the potential negative effects gain cooperation of the local people. Advantageous factors are primarily in economic development so services that the government could not provide such as health centers, police departments and schools can be established. However, with economic development, money becomes a dominant subject of interest. This can bring about major conflicts that a local community in a developing country has never dealt with before. These conflicts emerge by a change to more egocentric views among the locals influenced by consumerist values. The effects of the exploitation of natural resources in the local community of a developing country are exhibited in the impacts from the Ok Tedi Mine. After BHP, now BHP Billiton, entered into Papua New Guinea to exploit copper and gold, the economy of the indigenous peoples boomed. Although their quality of life has improved, initially disputes were common among the locals in terms of land rights and who should be getting the benefits from the mining project. The consequences of the Ok Tedi environmental disaster illustrate the potential negative effects from the exploitation of natural resources. The resulting mining pollution includes toxic contamination of the natural water supply for communities along the Ok Tedi River, causing widespread killing of aquatic life. When a mining company ends a project after extracting the raw materials from an area of a developing country, the local people are left to manage with the environmental damage done to their community and the long run sustainability of the economic benefits stimulated by the mining company’s presence becomes a concern. ^ Cronin, Richard. (2009). "Natural Resources and the Development-Environment Dilemma." Exploiting Natural Resources. The Henry L. Stimson Centre. p. 63. ^ Planas, Florent. "The Exploitation of Natural Resources". Un An Pour La Planete. Retrieved 22 March 2012. ^ McNicoll, Geoffrey (2007). "Population and Sustainability". Handbook of Sustainable Development (PDF). Edward Elgar Publishing. pp. 125–39. Retrieved 2012-03-13. ^ "World Population Prospects - Population Division - United Nations". esa.un.org. Retrieved 2018-06-25. ^ Pedro, Antonio M.A. (2004). Mainstreaming Mineral Wealth in Growth and Poverty Reduction Strategies. Economic Commission for Africa. pp. 5–6. ISBN 9789211250978. Retrieved 20 March 2012. ^ Pegg, Simon (2006). "Mining and poverty reduction: Transforming rhetoric into reality" (PDF). Journal of Cleaner Production. Elsevier. 14 (3–4): 376–87. doi:10.1016/j.jclepro.2004.06.006. ISSN 0959-6526. Retrieved 20 March 2012. ^ Weber-Fahr, M.; Strongman, J.; Kunanayagam, R.; McMahon, G.; Sheldon, C. (2001). "Mining and Poverty Reduction". Noord Internationaal WB PRSP Sourcebook. pp. 4–6. Retrieved 20 March 2012. ^ Bray, John (2003). "Attracting Reputable Companies to Risky Environments: Petroleum and Mining Companies". Natural Resources and Conflict: Options and Actions. World Bank Publications. pp. 287–347. Retrieved 2012-03-12. ^ Brereton, D.; Forbes, P. (2004). Monitoring the Impact of Mining on Local Communities: A Hunter Valley Case Study (PDF). CSRM. pp. 12–13.